We regularly update our materials on the MCF to keep things fresh and to reflect our own growth and learning. Near the start of the project I began using a couple of characters in comic strips to illustrate some of the breadth, and rules of comics – using the form of comics to discuss the fabric and syntax of comics themselves. The earliest versions of these comics were scratchy, odd and in places seem very peculiar when removed from the context of the workshops and publications they were printed in… but it seems wrong for them to be lost entirely. So, here’s a PDF of some of those early comic strips… it is interesting to see how far the resources have improved over the past year. We had a great time on Folkestone Harbour Arm running a workshop back in April. At this event we launch a new micro fold-up comic that people could learn to fold together and then complete at home, but many younger attendees also created some brilliant comic strips. You can now see the video of project lead Jim Lockey speaking at TEDx Folkestone about the MCF project and about drawing. This was an amazing experience which lead to some brilliant feedback from you people and adults to boot. Lots of people have since shared their stories with me and some have even sent their drawings. This talk is another expression of the ideas at the core of the MCF; anyone can art! It has been wonderful to have been so busy with mobile comics factory events and plans that I haven’t had much time to document things here on the blog… it’s great to be that busy, but I regret that there isn’t more here to show you. That there isn’t much evidence of all the brilliant things we’ve been doing. But that is set to change. Over the next week or so I’ll be posting a rash of updates to show off the amazing work of young people and keep you updated about future plans. Follow @mcomicsfactory on twitter Or @mobilecomicsfactory on Facebook keep abreast of these updates. 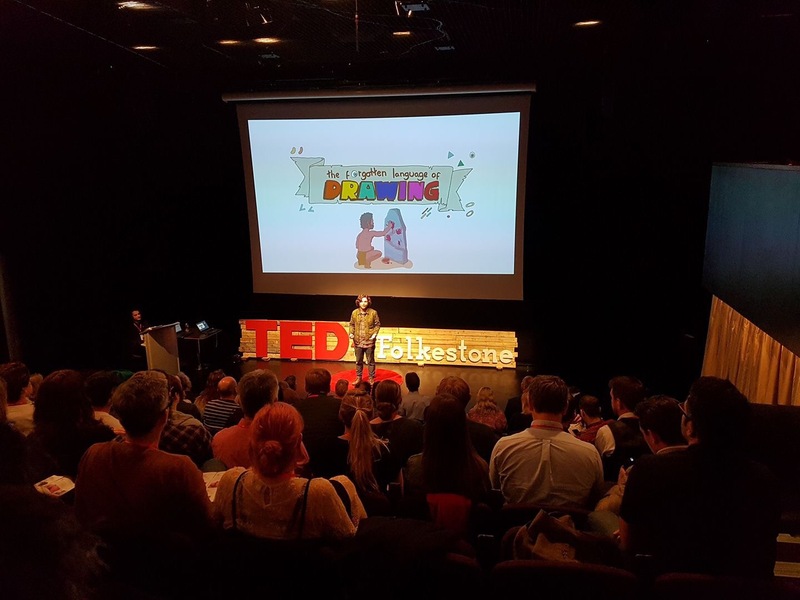 Last Saturday I had the immense privilege to speak about The Mobile Comics Factory – and about how brilliant drawing is to an attentive audience at TEDx Folkestone. This has been an amazing experience and a tremendous vote of confidence in the project… in a couple of weeks the video should be available online through the TEDx YouTube and beamed across the world to a global audience. The potential there is barely fathomable… though of course, it might just drift into obscurity. I haven’t talked about this experience on the blog because I haven’t really known how. It was so big I didn’t really know how to fathom it. And it’s all wrapped up not just in my goals for the project but in my personal life goals. However once the video is finally available I will tell you more about it… I promise. I want to thank all our supporters who have helped to make things like this possible for the project. A few weeks back I guested on The Big Ideas Show with Liu Batchelor on Academy FM. I talked about the project and together we discussed the role of experimentation in creative endeavor. You can listen back below. The general message was no new things can happen if you don’t leave your comfort zone, and let others inspire you – but don’t let comparing yourself to others stop you from doing your thing… but less wishy washy than that! There is also an embarrassing reference to 80s new wave for you to enjoy – really down with the kids! Nameless and Thief is the fantastic new comic / mini-zine created by Milena T, with the Mobile Comics Factory. Use the link below to download and print it yourself… and use the video provided below for instructions for how to fold it. In dreams is an 8 feet long drawing created by a year 10 carousel group at Folkestone Academy. Each member of the group contributed to the final drawing which sees a sleeping man fly through a series of increasingly bizarre scenes and into a night of lovecraftian horror!